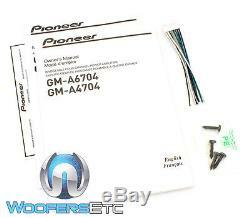 GM-A6704 - Pioneer 4-Channel 380W RMS Bridgeable Class AB A-Series Amplifier. 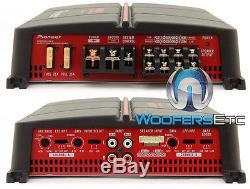 Class-AB FullRange 2-Ohm Stable 4-Channel Amplifier. 4 ohms: 60 watts x 4 chan. 2 ohms: 95 watts x 4 chan. Bridged, 4 ohms: 190 watts x 2 chan. Max power output: 1000 watts. Pulse Width Modulated MOSFET power supply. LED power (on) and protect (off) indicators. 4, 3 or 2 channel operation. Speaker-level (high-level) inputs with Signal Sensing Turn-on. 3-way protection circuitry (thermal, overload, and speaker short protection). Heavy duty aluminum alloy heat-sink for extreme heat dissipation. Low level: 300mV - 6.5V. High level: 3V - 26V. Frequency Response: 10 - 70,000 Hz. Total Harmonic Distortion (THD): <0.05%. Signal to Noise Ration: >95 dB. Selectable crossover modes (Ch A&B): LPF / OFF / HPF. Crossover frequency Ch A: 80hz, 12 dB/octave. Variable crossover frequency (Ch B): 40 - 500 Hz, 12 dB/octave. Variable Bass Boost (Ch B): 0 to +12 dB bass boost at 50 Hz. Dimensions: 13.75 W x 8.5 L x 2.375 H. You will be issued a Return Authorization Number. In order to maintain an inventory of 100%, Brand New, A-Stock, untouched products, all sales are final. We ask that you please be sure you are ordering the correct product. 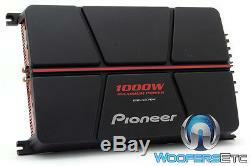 The item "PIONEER GM-A6704 4CHANNEL 1000W COMPONENT SPEAKERS TWEETERS CAR STEREO AMPLIFIER" is in sale since Friday, January 17, 2014. 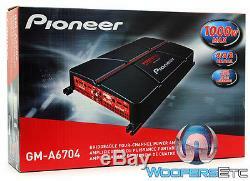 This item is in the category "Consumer Electronics\Vehicle Electronics & GPS\Car Audio\Car Amplifiers".